Simon & Finn visit Philosophy Now! This week’s Simon & Finn brought to you courtesy of Philosophy Now! The latest issue looks at the intersection of philosophy and literature. 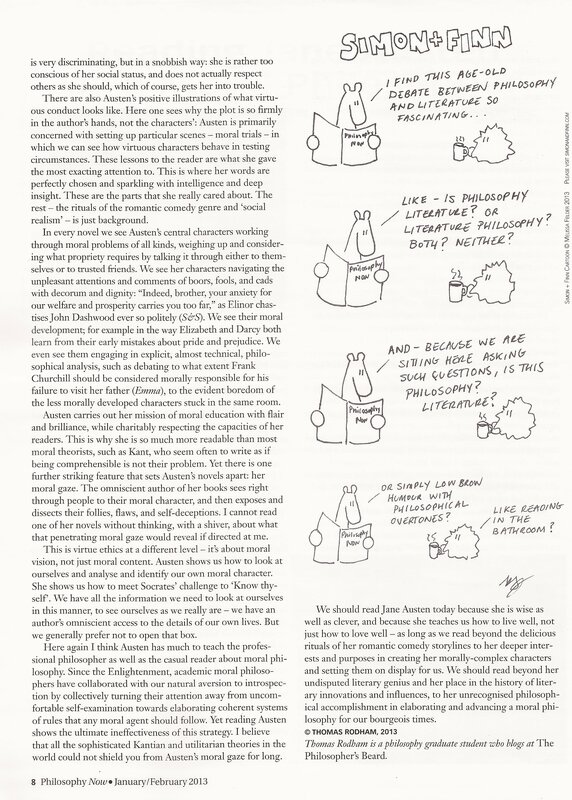 The next issue will explore communicating philosophy, so if you have ideas for cartoons, I’m taking suggestions! Next week: The Philosophy Now Reject Pile! This entry was posted in Philosophy, S&F Cartoons only and tagged philosophy and literature comic, Philosophy Now comic, philosophy webcomic, simon and finn comic, simon and finn philosophy now, simon and finn webcomic by simonandfinn. Bookmark the permalink. I’m going to be buying a book of Simon & Finn cartoons someday. I’m sure of it. And what is literature on philosophy but a circular argument…at least in an Excel spreadsheet you get a warning when that happens!